Last season, Campolindo head coach Colin Knightly was faced with a rebuilding year and set about creating "a long-term sustainable program." Forced to use a number of underclassmen last year has led to a successful season so far for the Cougars with a 6-3 record. Knightly attributes much of the success to his current group of seniors: "They really wanted a senior year to remember so there was a lot of off-season improvement and they came into the season ready to play." The offense has been led by junior Jean-Luc Axelrode and seniors Cole Barlow and John Cirelli. "Cole and J.L. 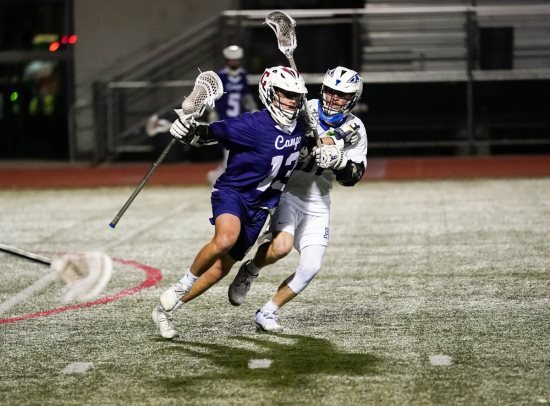 (Axelrode) have been very effective from the midfield positions," says Knightly, "Johnny is an attackman who came back after taking off last year and he has been a great addition." The leaders on defense are seniors Paddo Buckley and Tommy Raftis and freshman Grayer Leenhouts. 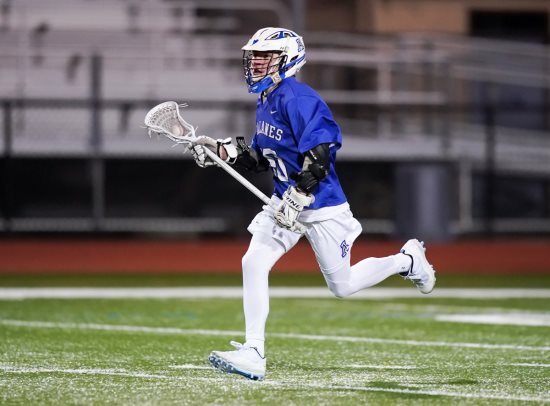 Though Raftis is a senior, it's his first year playing lacrosse after coming over from baseball. "Tommy is super athletic and has been great on defense," says Knightly. "We knew Grayer would be a good player coming in even though he was only a freshman." Matt Gagan who played goalie for the first-time last year, replacing an injured Brian Gross, has been solid in the net says Knightly: "Matt has done a really good job in keeping the games manageable and has been making some very big, clutch saves." Knightly's goal and philosophy is for the team to play a complete game: "We have to put together four quarters every game, not conceding or having a bad quarter. To win the war, you break it down into battles and each quarter is a battle. It's how many battles we can win and we want to win every quarter." Becoming the head coach of an Acalanes team that barely lost the NCS championship game in the last seconds would normally be seen as stepping into a positive situation. However, when that team has graduated 17 seniors, it's generally a time to rebuild. Despite a disappointing overall record, Acalanes placed third in the Diablo Athletic League with a 3-2 record. Acalanes coach Peter Harris knew what was coming as he was previously the assistant coach for the Dons: "It's been a hard adjustment but not an unexpected one. 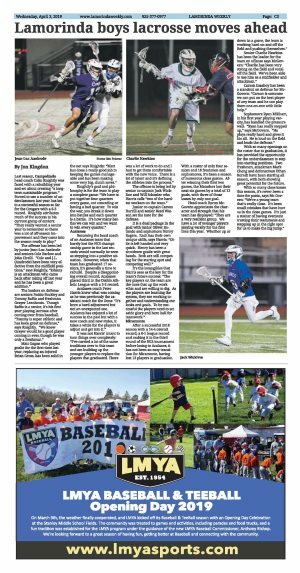 Acalanes has enjoyed a lot of success in the past but with a new coach and new styles, it takes a while for the players to adjust and get into it." It was not Harris' intent to turn things over completely: "I've carried a lot of the same traditions over to this team and am building up the younger players to replace the players that graduated. There was a lot of work to do and I had to get them comfortable with the new voice. There is a lot of talent and it's defining the athletes into the process." The offense is being led by senior co-captain Jack Wickline and Will Schueler who Harris calls "two of the hardest workers on the team." Junior co-captain Carson Burrill and senior Reed Watson set the tone for the defense. It is a dual package in the goal with junior Oliver Rotundo and sophomore Henry Rogers. Each has their own unique skills, says Harris: "Ollie is left handed and very quick. Henry has been a shutdown goalie with great hands. Both are still competing for the starting spot and competing well." It's the intangibles that Harris sees as the key for the team's future success: "The key players on the team are the ones that up the work ethic and are willing to dig. As the players are learning the system, they are working together and understanding our looks and goals. To be successful the players need to set aside glory and hero ball for teamwork." After a successful 2018 season with a 14-4 overall record, a 6-1 league record and making it to the third round of the NCS tournament before losing to Acalanes, it has not been an easy transition for Miramonte, having lost 13 players to graduation. With a roster of only four seniors and 18 freshmen and sophomores, it's been a season of numerous close games. After winning their first two games, the Matadors lost their next six games by a total of 13 goals, with three of those losses by only one goal. Head coach Byron McGovern appreciates the character and strength that his team has displayed: "They are a very resilient group. We have a lot of younger players playing varsity for the first time this year. Whether up or down in a game, the team is working hard on and off the field and pushing themselves." Senior Charlie Hawkins has been the leader for the team on offense says McGovern: "Charlie has been very strong on the field and vocal off the field. We've been able to use him as a midfielder and attackman." Carson Essaboy has been a standout on defense for McGovern: "Carson is someone we can put on the best player of any team and he can play them one-on-one with little help." Sophomore Ryan Millham, in his first year playing varsity, has handled the pressure well. "Ryan has really stepped up," says McGovern. "He plays really hard and gives it his all. He is loud on the field and leads the defense." With so many openings on the roster due to graduation, it has provided the opportunity for the underclassmen to step into starting positions. 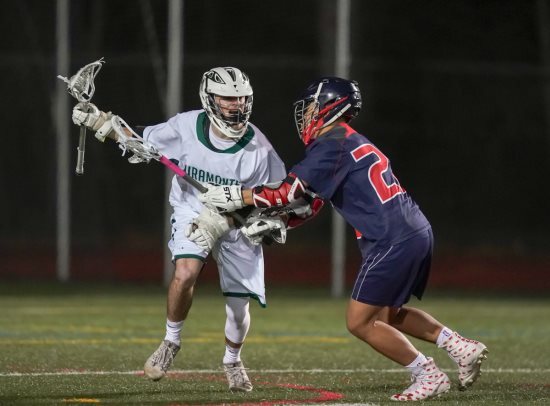 Two freshmen, attackman Mark Cheng and defenseman Ethan Berndt have been starting all season, with both showing great potential for the future. With so many close losses this season, it's never been a time for panic, says Mc Govern: "We're a young team that's really close. It's been small mistakes that have hurt us in the close games. It's just a matter of having everyone trusting their teammates and stepping up in the right spot for us to make the big jump."